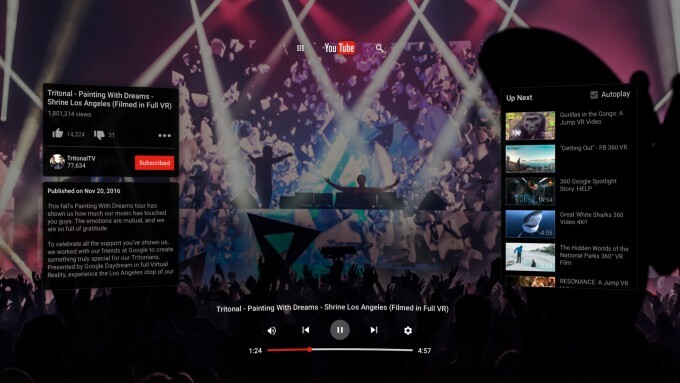 YouTube has launched a new app to coincide with today’s Daydream launch, one that’s built for virtual reality headsets and designed from the ground up to work with Google’s ‘next gen’ mobile VR platform. Immersive video and VR film has played a significant role in mobile virtual reality content, a trend that began with Google’s blindingly successful low-cost VR initiative Cardboard, later being taken up by the Oculus engineered Samsung Gear VR. But although you can view content via the standard apps and web channels in VR headsets right now, the functionality has always felt less than integral and mostly ‘tacked on’ and half-baked. With the importance of VR video content in mind and the release today of Google’s flagship Daydream headset ‘View’, YouTube have launched their latest app, “built from the ground up and optimized for VR”. Appearing on Daydream first, the new application works with Google’s first flagship, Daydream certified Pixel phones and the new Daydream controller and will also bring forward voice search features, particularly handy when immersed. 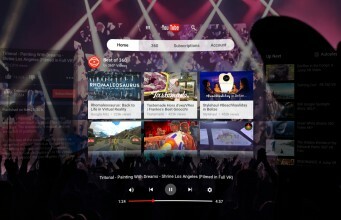 YouTube’s press release however was heavily focused on the creative and content possibilities for videos to be viewed on Daydream. The company seems to be broadening its experimentation with different content types, some of which build on formats largely popularized by its service. You can spend time touring beauty vlogger Meredith Foster’s apartment should you so wish, join Tastemade for VR cooking videos and watch breaking news in VR with HuffPost RYOT. You’ll also be able to watch standard videos on a virtually projected ‘cinema’ screen too. All of the above incidentally are producing videos in full stereoscopic 3D at 4k resolution or above, so while video quality is still not at the level I personally would like to see immersive video aspiring too (see my thoughts on this here) it does feel as if there’s an effort on Google’s part to set a benchmark for immersion with video on Daydream. This is a good thing and having an official app which delivers a VR focused experience from that good quality content is a big deal for VR in general, not just Daydream. For initial impressions on how Google’s Daydream platform, the new View headset and YouTube VR stack up, check out our review here. The post New YouTube VR App is Completely Re-designed for Daydream appeared first on Road to VR.